Right now, it is either 70 degrees or below freezing outside — that’s the joy of living in the Austin area during the winter. Outfitting your home with custom exterior screen shades can help you normalize the temperature at both extremes, all year long. Invite your friends over for a drink out on your porch without worrying about one of those famous cold (or heat!) fronts. Exterior shades in Austin allow you to enjoy patio weather year-round! 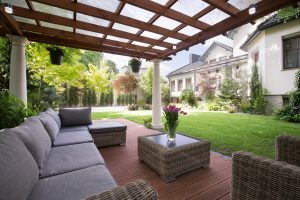 Whether it is a freezing gust of wind or the intense Texas sun beating down on your outdoor patio, the weather can take away from the space that you would love to be able to relax and recharge in year-round. Make the most out of your outdoor space by investing in custom exterior shades. Not only do they look fantastic on your home, but they also make your exterior spaces more liveable. At Southern Shutters Shades and Blinds, we are pleased to offer high-quality exterior shades from Southwest Sun Control. We are confident that they provide the best product on the market. If you are looking to invest in motorized shades for year-round temperature control, we can help you enjoy the very best in exterior shades. Exterior shades can block light, heat, cold, and wind. And because they are customizable, they block each to the extent that you want. Motorized shades are also key for taller or harder-to-reach spaces. Give us a call and we will schedule a free in-home consultation, to discuss your desires and what is possible with exterior shades. Metal tracks that keep bugs and dust out of your patio with a tight seal. Programmable timers so you can set your shades to lower and raise when you want them to. Wind and RTS sensors to protect your shades from extreme winds and other weather factors. One remote to operate all of your shades. And what about sizes and levels of shading? Our exterior shades come in standard, heavy duty (the best and most durable materials), and light (for areas that do not require an industrial shade). Our team of experts can help you decide which is best for your home, and why. Are you interested in outfitting your home with exterior shades? Custom shades in Austin are a wonderful investment for your home. Contact us to schedule a free in-home consultation today!